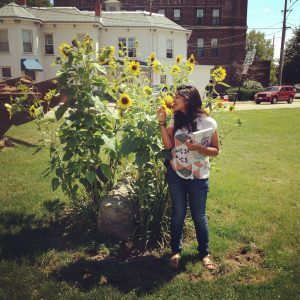 This blog post is by Amrita Gulati, an AmeriCorps Orchard Organizer with the Baltimore Orchard Project. We host monthly nursery workdays at the Baltimore Orchard Project (BOP) in order to involve volunteer community members in caring for our fruit and nut trees. As part of those workdays, I have started to provide culinary and nutrition demonstrations and sampling, in order to showcase the different marvelous ways we can enjoy local & seasonal produce. Serving as an AmeriCorps Orchard Organizer at BOP has helped me learn about so many different plants that grow all around us, in Clifton Park’s food forest, and throughout Baltimore City farms and orchards. I am interested in learning about different culinary traditions and trying out creative recipes using the fruits, herbs, nuts, and vegetables I have available. I LOVE food, and creating recipes for nutrition demos has helped me grow as a budding cook, and challenged me to overcome my fears and limiting notions about my capacity to create. I have had the pleasure to try my hand at cooking with produce we have been harvesting and using as part of our programming and festivals. During the month of June, we harvested mulberries and serviceberries (also known as “Shadbush”, alluding to the arrival of shad fish runs, and “Juneberries,” for their brief early summer harvest period) as part of our Mulberry Madness Festival. In addition to these berries, there are plenty of seasonal herbs growing around us, including mountain mint at Real Food Farm. Before this June, I had never heard of or eaten serviceberries before, and had only sampled mulberries occasionally. While harvesting these fruits from fruit trees all around the city (from Latrobe Park, Druid Hill, Midtown, Woodberry, and more) I ate so many berries, ripe and fresh. I started to dream up recipes we could try for the nutrition demos. I was craving sweet summer treats: snow cones and ice cold sodas, sold at festivals and stands all around Baltimore during these months. In doing research on mulberries, I learned about how they have been made into syrup that’s used in sherbert and cold summer iced juices, known as Shetoot, in Persian & South Asian recipes. Mint is used in many different drink recipes, including agua fresca. How cool is it that recipes from other countries, mirror favorites from Baltimore? Can we make use those principles to make summer treats that folks here would enjoy? 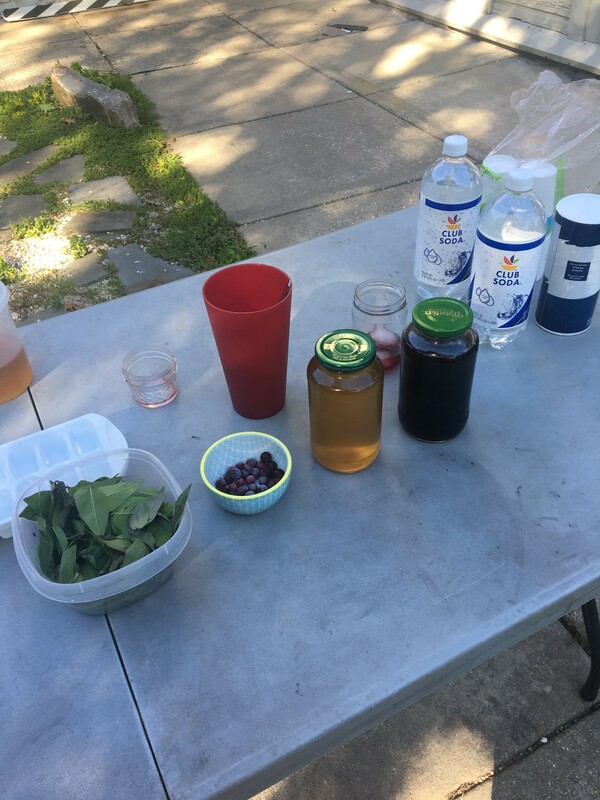 Tabling with club soda and mountain mint & serviceberry syrups, for folks to mix together for their desired sweetness levels, ice and frozen serviceberries & fresh mint to add as a garnish. Often artificial flavored syrups are used in summer drinks and snowcones to mimic fruit flavors, but they don’t come close to capturing the complex and delicious scents and tastes of the real thing. So, why don’t we make recipes with fresh ingredients? Syrups are actually quite simple to make, just take fruit, herbs, cane sugar, and water. At the BOP office kitchen, I used some of the serviceberries (picked fresh, and frozen to preserve) and fresh mountain mint we harvested, to make two simple syrups, cooking the berries and mint down with sugar. The sweetness helped temper some of the sharpness of the mountain mint. After the syrups cooled, I strained, jarred them and refrigerated them. For our nursery workday nutrition workshop, I mixed the syrups along with club soda to create a refreshing, light soda that our staff and volunteers enjoyed. I’m saving up funds to buy a snowcone machine, and once I do, I’m looking forward to experimenting with many more syrup recipes to create lots of different snowcones families in my neighborhoods can enjoy. I would highly recommend trying out different homemade syrups! You can use the same principles with whatever herbs & fruits you have on hand: lemon balm, basil, lavender, wineberries, rainier cherries (my favorite summer fruit), apricots, elderberries, and more. Be creative. You can use these syrups in above mentioned recipes, as a topping for ice cream, and on top of cakes. They’ll be a hit with your friends at cookouts and parties! Show Us What You Make! Share your photos of your homemade sodas and snowcones on Twitter and Instagram and tag @baltorchard! Like what we do? Donate to support the Baltimore Orchard Project! 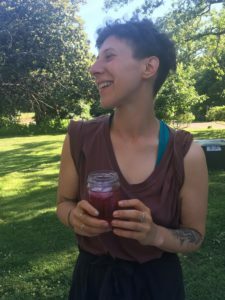 Our amazing Youth Education coordinator Vanessa, enjoying a fresh iced serviceberry soda!